Do you have the gift of gab? Are you a serial Tweet-er? Are your social connections and oratory prowess only surpassed by your running PRs? Do you want to be part of the race weekend crew? Are you excited about the adventure of 13 or 26 Miles through America’s Largest Backyard? We have some exciting news for you! We are asking enthusiastic and well-connected runners from around the country and the globe to help spread the word and represent the 2018 edition of the Asheville Marathon & Asheville Half Marathon at Biltmore Estate… and offering awesome incentives to do it! APPLICATIONS ARE DUE MONDAY, JUNE 12th, 2017 by MIDNIGHT! 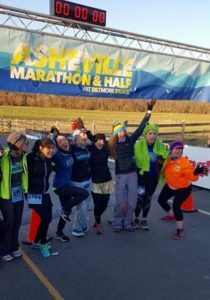 Spreading the word and answering questions about Asheville Marathon & Half events to others in local running clubs, as well as through social media, blogging, and otherwise. Blogging, Facebook shares and tweeting regularly about upcoming news from the Asheville Marathon & Half. For their efforts, ambassadors will be recompensed with a variety of rewards. These perks will include complimentary registration, Official Marathon & Half Ambassador Gear, discounts on other events & services, a personal profile hosted on the marathon website, perks from race sponsors, and additional incentives during race weekend, based on involvement… and we are still adding to the list! Additionally, we will open up certain opportunities to our Ambassadors first. These may include pre-race interviews, news stories, merchandise giveaways, Pace Team invitations, sponsor product giveaways and inclusion in special race weekend happenings. Throughout human history, one of the most prominent roles of great distance runners was that of messengers. The Asheville Marathon at Biltmore Estate wants to revive that heritage of communication by the fleet of feet with our Ambassador program. To sign up for your chance to be a part of the Ambassador team, visit the official Ambassador Program Details page or skip directly to the Application Page which includes all the information. Ambassador applications are due by June 12th, 2017 at midnight.